Arco-Íris (Leiria, Portugal) on 19 September 2008 in Cityscape & Urban and Portfolio. Vraiment une ravissante lumière avec de belles couleurs j’adore. A dramatic and beautiful cityscape. I love all the detail in this especially the bridges. Very well done. A beautiful capture of one of my favourite cities. Well done! Beautiful view and light. Excellent. I love the rays of light! Well done! A fantastic shot...great colour and DOF. Good work Ana Lucia! What a stunning sky....excepcionais shot! 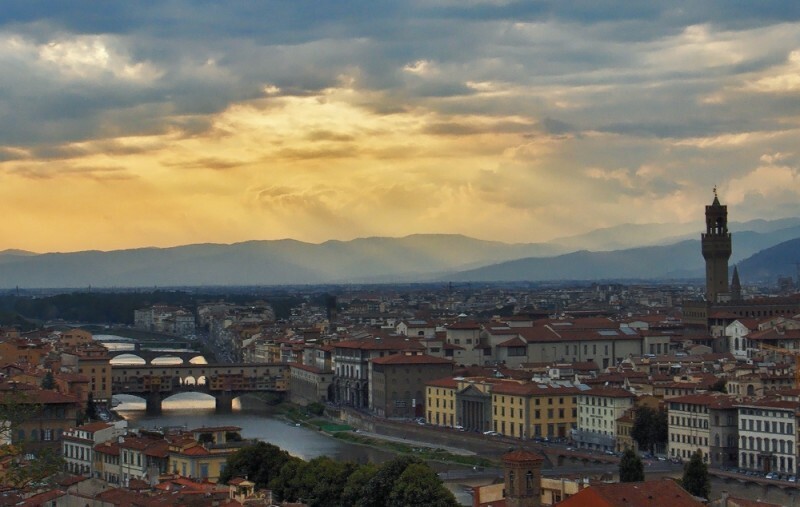 Wow, this is a brilliant panoramic view of Florence Ana! What a wonderful place, really! This is just gorgeous! I love your shadow detail of the city and the light you capture too! Best photo I've seen today! @Craig: Thanks so much Craig, I really appreciate this ! Uma vista clássica de Florença, com o céu a fazer a diferença. Beautiful light on Firenze. The composition is superb. This is a spectacular city on the water. I LOVE the architecture and the way the mountains rise up beyond the city. Spectacular. Magnificent! The panoramic view and light are just splendid! Wow Ana, you blew me away when I opened this image, such amazing work, congratulations my friend! Beautiful shot, did you see the series by Evelyne Dubos? I once stayed in a campground very near to the spot where you took this picture and remember the sunsets there. I love the way you captured the sunlight filtering through the clouds. What a beatiful city. The sky looks so bright! Brilhante!!! That is a lovely looking place. Ah A bela Florença. Para mim a mais bela cidade italiana. Captada sob uma luz fenomenal, dando-lhe um tom ainda mais místico. Gosto do pormenor dos raios solares a romperem por entre as nuvens. The unique glow over the city makes for a very unusual shot. The detail and rich colors under that marvelous sky make for a fine picture. Wonderful capture of this city! Great point of view on Florence and the well known "Ponte Vecchio" and beautiful sky. Brings back wonderful memories to me, a wonderful shot! Gorgeous shot. Love the landscape. What a lovely sight and beautiful landscape! Enjoy the tone and lighting you've captured... wonderful shot! this is a great shot in every respect! well balanced light, good detail in the city foreground and stunning backdrop that really creates a dramatic mood - superb work! Beautiful sky, lovely light and colours! Fotografia elegante e com uma luz excelente. A hora mágica, funciona sempre bem nas fotografias. Beautiful city scape with the light reaching down. A luz estava no ponto e tu no momento certo. Great city very well captured. Beautiful picture. beautiful view. my girlfriend call photos with light like this "god shots." Obrigado pelos comentários. Gosto imenso da cor do céu, bom enquadramento tb. Lovely light in this image. Stunning capture Ana Lúcia - postcard quality!